California is by far the most populous state in the country, with over thirty-nine million people, representing more than 10 percent of the total US population. California is home to Silicon Valley, the tech capital of the United States, and some of the most acclaimed institutes of higher learning in the country, such as USC, Berkeley, and Stanford University. California has long been an ideal vacation destination in the United States due to the wide variety of climates and landscapes, providing for any preference. With tourist destinations from San Francisco to Napa Valley to Disneyland, California has appeal across a broad spectrum of people. Despite its enormous population, California has remained below national averages for opioid prescriptions written, and for opioid-related overdose deaths, according to the National Institute on Drug Abuse (NIDA). But California is one of several states bordering Mexico, where cartels import massive amounts of heroin, methamphetamine, and cocaine. Drug traffickers travel through California's southern border with Mexico, where the drug influx directly impacts nearby counties. By 2013, addiction treatment admissions for heroin and methamphetamine in Los Angeles County became more common than alcohol, cocaine, and marijuana. And according to SAMHSA's 2014 Treatment Episode Data Set (TEDS), California has continued a relatively steady increase in drug treatment admissions for heroin and opioid painkillers, although it is currently ranked in the bottom ten states for drug overdose death rates in the country. California's drug-related arrests have been primarily for narcotics, excluding marijuana, which makes up about 19 percent of felony drug arrests in the state. Due to California's liberal approach to marijuana and overly punitive drug-related incarcerations, the state has reduced such felony and misdemeanor charges by a staggering 68 percent, according to the California Department of Justice. 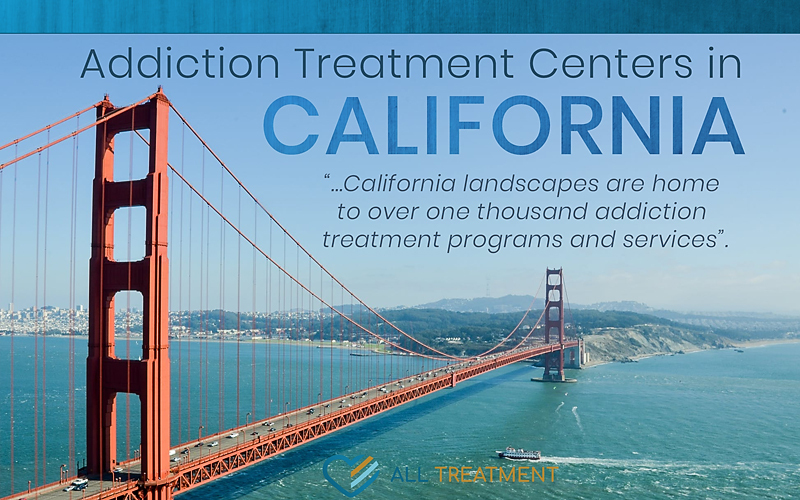 From the mountains, valleys, canyons, beachfronts, deserts, or lakes, California landscapes are home to over one-thousand addiction treatment programs and services. Mostly concentrated in Southern California and the northern coastline, addiction treatment in California has some of the highest nonresident populations in the country.